Paul Kloschinsky has just released his newest album, Better Late Than Never, at the end of 2014. The stunning album blends complex elements of folk, indie and rock, creating a pleasant, and surprising 10-track album. Kloschinsky’s voice hovers over the tracks with a unique and steady hand. Kloschinsky currently resides in Delta, British Columbia, Canada, where he hones his songwriting skills. These skills are evident in Better Late Than Never, his fourth release. With several music accolades under his belt, he embraces his songwriting on these new tracks. Opening up the record is the breathtaking piece, “Across the Sea.” Acoustic guitars are prominently strummed throughout the track, accompanied by an array of instruments that help bring the song to life. Kloschinsky’s voice is not overpowering, but it stands out and speaks volumes. The folk and Americana element is already noticeable within the track, which will carry through the record. “Better Late Than Never” is the title song from the album, which serves as a perfect representation of the overall feel of the collection. In the song, horns enter slightly that work in perfect unison with Kloschinsky’s vocals. “When Dawn Breaks the Night” brings a very alt-country/indie-folk sound to the record reminiscent of an early Bright Eyes song. The addition of strings makes this piece an instant favorite. The vocals in the track are flawless, and the combination of instruments compliments each other nicely. “Give Me a Sign,” brings a slightly different, more up-tempo feel to the album; bringing a true Rock n’ Roll sound into the record. “Pearl from Paradise” and “What Good is Love to Me,” usher a downbeat sound into the album. “Pearl from Paradise,” is filled with gorgeous piano work that will draw you in closer, listening to every melodic note that fills the space. “The Soft Glow of Midnight,” brings the album back to life, with a slight undertone of 80’s elements. Synth keys are flowing throughout, giving the record an even more pleasurable and well-rounded musical experience. “Sundown Tonight,” is a breathtaking and heartbreaking piece on the record, with a beauty you will not be able to shake. The melody takes you away to a musical journey. “Knock on Wood,” fills the record with a strong and powerful string section that acts as a musical bed for Kloschinsky’s strong vocals. The piece proves to be gentle, and insightful in content. Closing out the record is “Electronic Paradise,” which is the perfect way to end the collection of songs. Clocking in at just over 5-minutes, the synth laced track combines a complex set of musical undertones to create a track that is compelling and danceworthy; adding something new to the album. Paul Kloschinsky’s Better Late Than Never is a stunning collection of songs that will surely stand the test of time. Kloschinsky’s talent for songwriting and crafting together the perfect song goes above and beyond to impress in this record. This is one record that fans of folk-laced music should check out for 2015. The CD wastes no time getting off the ground with melodic intro piece “Across the Sea”. This song serves up infectious folk ambiance against mesmerizing vocals, hypnotic guitar and driving rock rhythm that leads you by the hand down the path of soulful musical indulgence. Track 2 “Better Late Than Never” shifts gears a bit with its slamming Keyboard and impressive musical build to the chorus and thought provoking lyrical content, inviting/soulful vibe and infectious charm from Kloschinsky. Track 3 “When Dawn Breaks Through the Night” a somewhat striking piece that is full of musical peaks and valleys, impressive rhythm guitar that flow and ebbs its way through to emotional fruition. As the CD slowly unfolds I can hear many musical influences reminiscent of a classic Roy Orbison, John Cougar. Todd Rungren, Marc Ford, Gov’t Mule, John Cougar, Northern Mississippi All-stars, The Allman Brothers and Tom Petty. I would classify this music as rocked out Soul, Singer/Songwriter and Americana Folk-Rock with a fun and electrifying flair. The CD at times adequate brilliant peak and valley flow via a strong American perspective (via the lyrics) that takes no prisoners. Besides the four piece standard you will also notice rich layers of Electric Guitar, solo guitar, Keyboards, and enticing melodies – all built on a electronic drum rhythmic foundation. As a vocalist Kloschinsky showcases a budding and soulful singing skill set. He’s got good songwriting instincts. He’s got a good “rugged” look. All the musicianship and compositions are pretty solid across the board. Kloschinsky has an effective baritone and his vocal risk-taking and overall touch behind the microphone are consistent. From rocking “Give me a Sign” to flowing “What Love to Me” to danceable “The Soft Glow of Moonlight” this CD has something for just about everyone. The CD ends with Track 110 “Electronic Paradise” the perfect finale statement for a CD of this caliber. “Better Late Than Never” by Paul Kloschinsky is a compelling, soulful, melodic, musical journey. The music is diverse, consistent, grooving, upbeat, soulful and entertaining. The songwriting – all consistent musical experiences, each one possessing a unique personality, flair and signature groove. This CD will be a real joy for those listeners out there who want an old school folk-rock experience to fill their atmosphere. This straight forward, easy to digest musical format makes for a great musical experience many will enjoy. I recommend you just hit play, close your eyes and see where the journey takes you. With all the science and statistics gushing forth from the past century, celebrated by the bright light of the media, it seems to some that the answers to our most profound questions have been answered, and the doctors and engineers have everything under control. Although the rise of reason and humanism was a reaction against religious dogma, and has determined much about matter that calls into question a literal biblical explanation of things, this same reason and humanistic spirit has grown cocky, thinking it has solved everything, and all its conclusions are certain, beyond reproach, and now puts forth dogmatic proclamations of its own. Well, I take exception with anyone who thinks they have definitively solved all the mysteries of life, and put forth their views as certain, whether it is from a religious or a scientific atheist viewpoint. For all our technological advances I feel humanity should now regain a sense of humility before the great mysteries that still remain, including our origins and spiritual nature, and the ultimate meaning and outcome of life here on earth. Instead of crowing about our superiority over all on this planet, perhaps it is in order to regain a sense of awe and wonder before the sublime, like the stars, the seasons and the magnificence of nature, which all came into being with no human input or intervention. Perhaps it is also in order to develop a new philosophy of reason and science that acknowledges both its strengths and weaknesses in determining truth in different domains. In my view, science is the best way to determine objective world truths about matter, but it falls short in the subjective world, which is qualitative and not easily quantified, and is best approached with myth, allegory and poetry. It is this subjective realm that is full of mystery and magic, and is what alchemy, the kundalini and Arthurian myths are referring to and where they are valid. You can check out my photography, poetry and songs at http://www.kloschinsky.com. “Make it new!”, was the rallying cry of the early 20th century, and novelty and the advant guard become the main measure of success in the art world. Since the late 19th century, with the ascent of the machine and the new urban experience, the western world was changing into something new and unknown, and art was expected to express this change and progress. Since Darwin, Freud, Marx and Nietzsche at the fin de siecle, the official position of the academics and intellectuals was athiesm, and art expressed this bleak view, and the so called absurdity of existence. The long march of modernity, with its deification of reason and science, from the Renaissance to the modern world, left some artists in favor of the changes, and others in marked opposition to it, particularly as this “progress” led to the horrors of World War I. Soon the art of the past was seen as not relevant anymore in this new world of machines, industrialization and large cities. With the destruction of World War II and the horrors of Auschwitz, this atheistim and bleak existentialism was felt even deeper, and the art of the rest of the century expressed a meaninglessness and despair unparalleled in human history. The march of progress continued though, as new electronic inovations happened at breakneck speed, including the TV and computer, and the art of the past seemed hopelessly inadequate to deal with the new changes and attitudes of the modern world. In fact, it seemed that anything that hadn’t been on the TV was considered irrelevant and superfluous. By the end of the century post modernism declared all cultural productions to be deconstruct-able to meaninglessness, but I doubt this was truly the successor of modernism, since it still retains its predecessors complete atheism and nihilism. Now as the new 21st century is dawning before us I feel a new art is necessary, one that reintegrates the traditions of art present since the beginnings of humanity, and helps heal the spiritual malaise that plagued most people in the past century. The proud traditions of faith, beauty and hope found in art prior to the 20th century can serve as signposts to lead us back from the brink of destruction to a reconciliation with nature and the transcendent, and a healthier, more balanced attitude towards existence on this planet. An art that moves beyond the atheism and despair of the 20th century, and expresses a renewed spiritual grounding, may be truly fitting to call the successor of modernism. If you liked theae thoughts, may I suggest you check out my previous newsletters at kloschinskyblog.com. You can also check out my poetry, photography and songs at kloschinsky.com. The long march of reason and science to its present supremacy has not been without its casualties. Starting with Socrates and Plato, who insisted on using their reason to approach the problems of life, the discipline of philosophy was born. Although it was overshadowed by religion in the middle ages, reason again surfaced in the Renaissance with the rebirth of humanism, or the idea that man can use his reason to evaluate things, and not just accept religious dogma. This led to the 18th century Enlightenment, where reason was crowned as the monarch, and philosophy and science flourished. This climaxed in the past century with the breathtaking discoveries of science, and the mesmerizing magic of the engineers. It seems now that modern humanism not only asserts that man can use his reason to evaluate things, but in a hubric fashion asserts that reason and science are the only way of evaluating things, and all will be intelligible to the intellect. Indeed, as its proper field of study is the objective world, or matter, science has determined the hard mathematical constraints of the outer world, and has discredited superstitions and magical thinking. After Darwin it has been believed that the material world is all there is, with its hard rules and bleak final outcomes. Lost is a sense of mystery, and a humility, in front of life’s deepest questions. The thorough debunking of religous dogma by science has left people without a spiritual anchor, and Logos in its long march to dominance has claimed Spirit as it’s casualty in the 20th century. I believe it is in the subjective world that Spirit is found, which lies beyond reason and science, and is by its nature surreal and ultimately unintelligible. Just as Galileo asseted the findings of science when the pendulum had swung too much in the favour of irrational, religous dogma, so now it has swung too much to the realm of rational, scientific materialism at the expense of Spirit. Perhaps our task in the 21st century is to accept the miracles of science and engineering, but also to reassert the transcendence of the spiritual, that so many hunger for, with a faith that can accommodate the scientific facts. My photography, poetry and songs can be found at http://www.kloschinsky.com. Its been around for 60 years now, has proliferated so it is everywhere, and is the way most people spend their leisure time. And it sends one message – everything is random, cling to life as desperately as you can, and the best you can do is to skew your odds as much as you can based on the scientific statistics. The television, with its ubiquitous screens, seems to me to represent a collective ego, which is young, petrified of death, and consumed with worry about all sorts of issues. I think living in this artificial media world on a constant basis leaves people neurotic about all sorts of possible tragedies, and in a state of denial about the inevitable facts of the life cycle and mortality, and trivializes the best way anyone has ever had to face these hard facts – a faith in a higher power, a purpose to our time here on earth, and the golden promise of a just afterlife. I wonder if people realize that, regardless of all our technological progress, the brevity of the lifecycle and the inescapable finality of a cold winter’s tombstone is unavoidable and here to stay, an acknowledgement of which would enlighten people about how to best to spend their limited time here, instead of living, and eventually dying, in a state of denial about the hard stony facts of life. Indeed, the only valuable stage of life that the TV tells us is youth, and it is completely lost what are the advantages, and what is appropriate, at all the stages of the life cycle, including eventually dying. I think a lot of people’s sense of history and culture are from what they have seen on the TV, thinking this mainly junk food diet is all that is important, and missing all the sources of meaning to be found in historical cultures prior to JFK and the Beatles, or in leaving the media world behind sometimes to embrace the cathedral of nature. If these thoughts resonate with you may I suggest you check out my other newsletters. You can also check out my poetry, songs and photography at http://www.kloschinsky.com. There have been breathtaking advances in science and engineering in the past century, as we continue to be dazzled by the next new thing in electronics, that seem to be perpetually making our lives easier and more fun. With all this progress, it may seem to many that the engineers and doctors have everything under their control, and have it all figured out. The big bang and Darwin’s theory of natural selection are thought to explain creation, with the universe and human beings being the machine like, or computer like, deterministic products of random forces. Unfortunately, the past century has also been a time of wide spread existentialism, with its atheism, despair and to many a bleak view of modernity and humanity. For all its technological wizardry, modern life seems to lack something fundamental, a sense of meaning and a connection to something greater than ourselves. It seems to me that although it is advanced in its understanding of the material world, science has not solved the fundamental mysteries that have engaged humanity since its beginnings, and we need to look elsewhere to have an understanding of the spiritual questions that are still with us, regardless of our technologically advanced lives. 1) How the world was created. Darwin’s theories being just one way to explain what was driving the evolutionary process, as the intricate balance and beauty of nature seems to me more likely to be the product of a designing consciousness, rather than random, purely materialistic forces. 2) Is there a higher power? Regardless of how they’ve tried, the existence of a hidden, guiding higher power has not been proven impossible by science. 3) Is there an afterlife? This whole damn journey seems absurd if it all ends up as dust in the desert. 4) How and when a person will die. For all modern medicne’s advice on the healthy lifestyle, it is always a mystery until it happens how we will eventually perish, and the only certainty is that we all will one day. It seems to me that it is time to acknowledge what we have figured out with our science, and to also admit its limitations, so we can turn to other sources, such as religion, philosophy and the arts, to meet our famished needs for meaning, purpose and courage in the face of mortality. If you liked these thoughts, may I suggest you check out my other newsletters at http://www.kloschinskyblog.com. 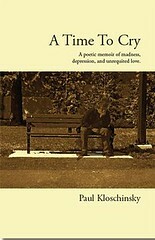 You can also check out my work in poetry, songwriting and photography at http://www.kloschinsky.com.